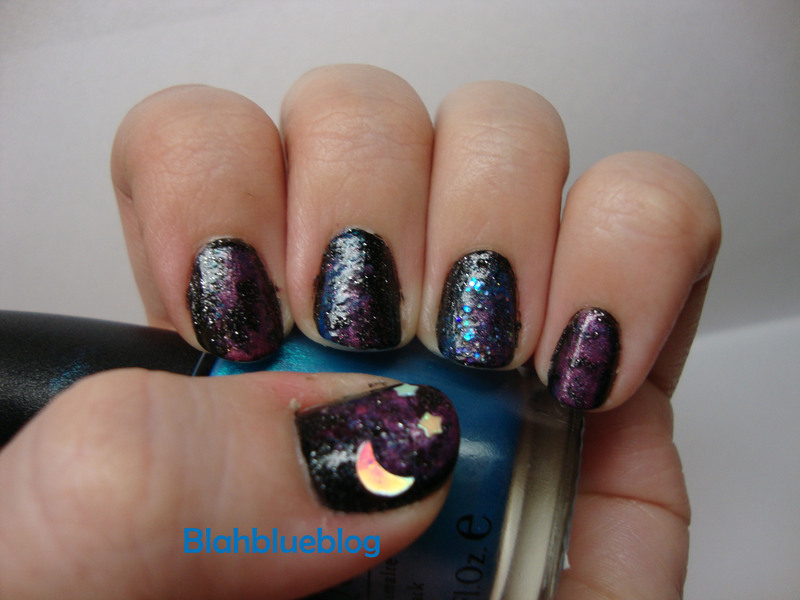 I finally got around to making my own version of galaxy or space nails. I have seen many different approaches but I used the sponging technique. Base Coat: China Glaze Haunting- A black base with tiny silver glitter. Sponging Colors: OPI Holy Pink Pagoda!- A hot pink and Azure for Sure- a turquoise blue. Glitter Accents: China Glaze Snow Globe- an iridescent, multi-colored glitter. Scrapbooking shapes- iridescent star and moon shapes. First I applied two coats of China Glaze’s Haunting as the base coat and allowed it to dry. Then I used a tiny chunk of sponge dipped in with either Holy Pink Pagoda! or Azure for Sure and lightly sponged splotches of color in concentrated areas to create the “cosmic dust.” If you find that you applied too much of either color simply sponge more of your base color over the top. If you desire to add “stars” simply sponge on a tiny bit of China Glaze’s Snow Globe. I also added some scrapbooking accents to my thumbs to emphasize the space theme.